Lopping off your long locks and going for a pixie crop might seem terrifying at first. However, time and time again we’ve seen this iconic haircut transform ordinary girls into supermodel style beauties. 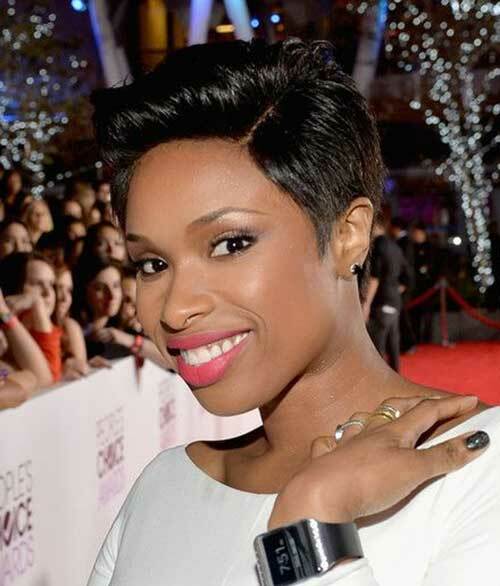 The pixie cut is a super short style which is typically worn slightly longer on top and shorter on the back and sides. Over the years, many celebrities – including Pink, Audrey Hepburn and Miley Cyrus – have made this iconic crop their signature style. Other stars, however, have simply experimented with the style and looked absolutely stunning while doing so. ANTM presenter, Tyra Banks, has even said that she notices people take her much more seriously when she rocks a pixie crop. 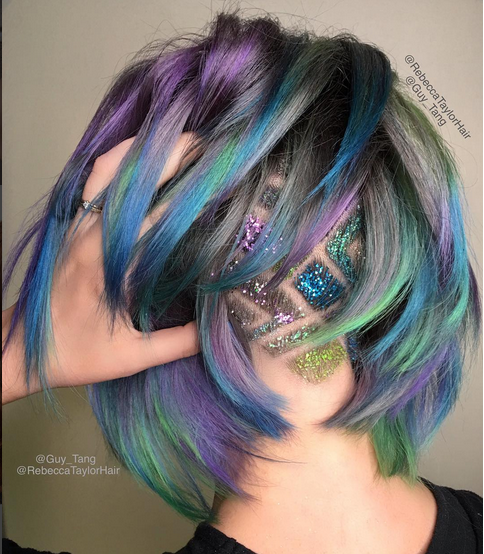 Despite being so short, the pixie leaves loads of room for experimentation with colors, styles and textures. Here are 20 of our faves. When you get a pixie cut you will be showing off your face shape for the world to see. If you’re proud of your prominent cheekbones, shapely jaw and sparkling eyes, then you’ll definitely suit this super short, dark brown pixie with a slightly feathered fringe. Put a slightly modern twist on a classic cut with this look. 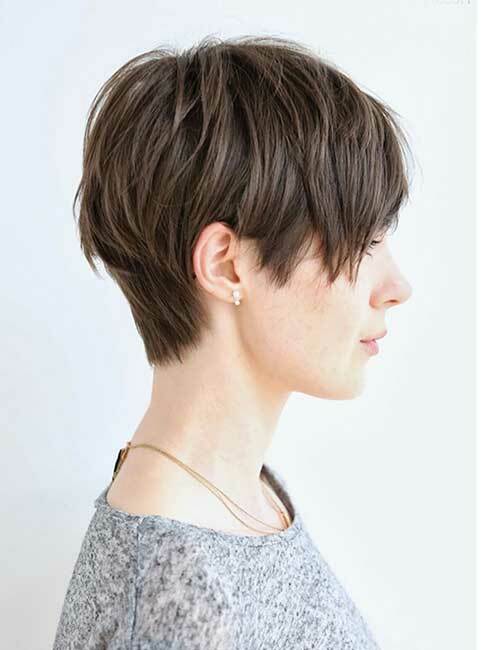 Ask your stylist to add loads of choppy layers to your hair and to leave the front a little longer than the rest and you’ll end up with a textured pixie like this one. It’s no secret that the pixie is a classic cut which has stood the test of time and can look flattering on just about anyone. However, if you’re someone who prefers to shake things up than follow fashion, why not add a touch of drama to your pixie by experimenting with bold hair art and colors? A sweeping side fringe is the ideal way to frame your face. Together with a pixie crop, some long bangs swept to one side can look flattering and accentuate all of your best features. This adorable haircut is clearly inspired by the likes of Audrey Hepburn and other vintage screen sirens. The short bangs and sleek layers look elegantly feminine, especially with pale blonde hair. It was her elegantly tousled pixie crop that first made acclaimed Hollywood actress, Jennifer Lawrence, a style icon across the world. This look shows just how voluminous a pixie can be. The addition of sun kissed, golden highlights make it totally trendy. 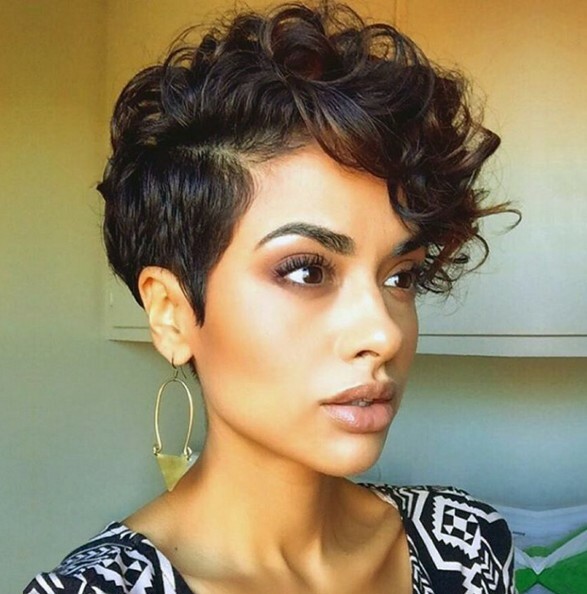 A short, jagged pixie cut like this is an easy way to look edgy without doing anything too dramatic. 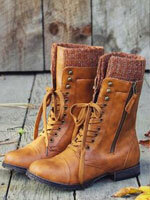 It goes especially well with the rich chocolate brown color and will look fabulous on any ‘rebellious at heart’ girl. We already know that sweeping side bangs are the perfect accompaniment for a pixie cut. This stylish look allows you to go daringly short without leaving too much of your face exposed. 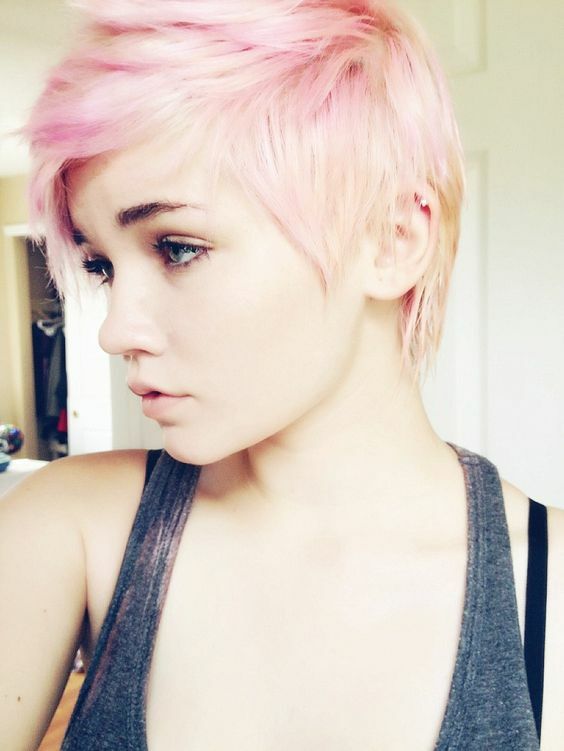 You don’t have to stick to a natural looking color to pull this cut off though; pastel pink adds a touch of magic fit for a real-life pixie. You might think that it’s hard to make a short pixie look girly and elegant enough for a glamorous night out. 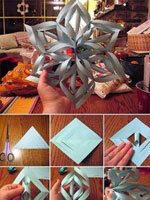 But it’s a lot easier than you’d think. Slick down your long bangs to create a sleek and polished look, fit for a 1920s flapper girl. Sometimes girls with round faces shy away from pixie cuts but Carey Mulligan proves that every face shape can look great with this cut. 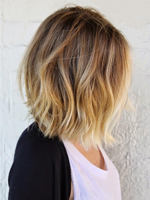 If you have a round shaped face, try this extremely short and choppy cut with baby length bangs. It’s been 15 years since the world first fell in love with Halle Berry’s pixie cut in the James Bond flick, Die Another Day. Her iconic image has stood the test of time and this curly, tousled do is still inspiring millions. A short, spiky pixie like the one Miley Cyrus is rocking here, is the ultimate cut for any punk princess. The jagged spikes create a raw, edgy texture and the shaved sides are completely on trend. We love the bold blonde too. Another glamorous and girly way to style your pixie is curling the fringe upwards. Curled bangs make your hair look perfectly polished with a vintage Hollywood twist. This has to be one of the most beautiful and eye catching pixie cuts we’ve ever seen. 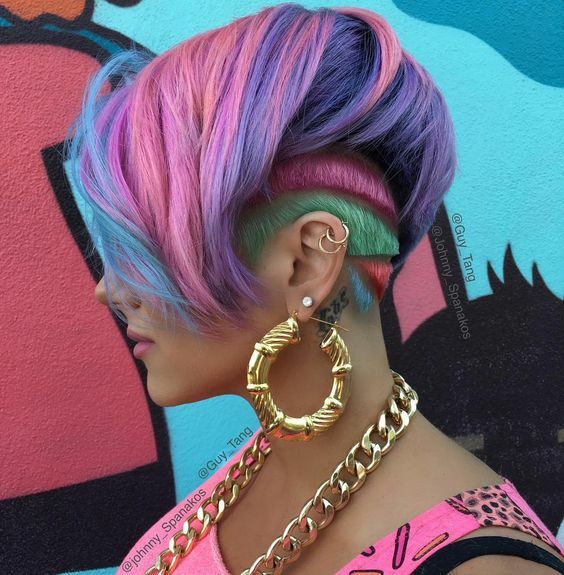 The palette of pastel rainbow colors complements each other perfectly and the shaved undercut is like a work of art. 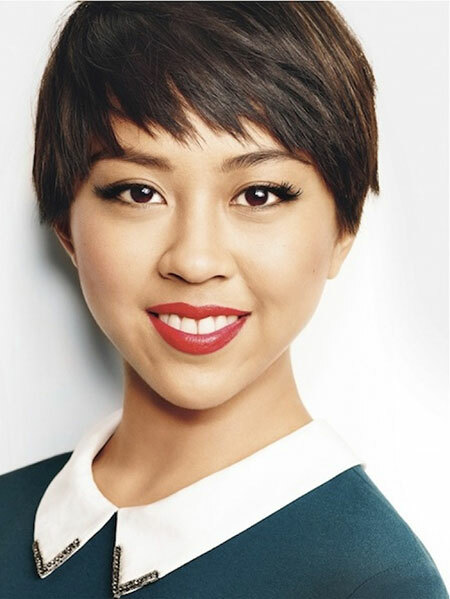 Short haircut for thin hair – the sleek pixie cut. If you’re looking for a way to stand out from the crowd while still looking effortlessly chic and stylish, this stripped back natural pixie is the way. Ask your stylist to give your short, sleek hair and all-over platinum blonde color. When many of us imagine a pixie, we think of a magical creature straight out of a fairytale with red hair and freckles. This is why girls with this ethereal natural coloring can pull off a scruffy, messy pixie cut so perfectly. 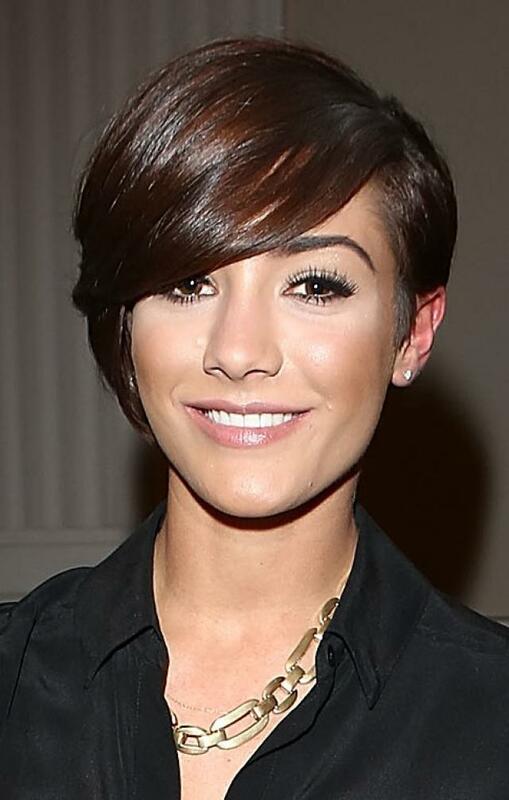 This gelled down pixie cut with a deep side parting is the perfect blend of masculine and feminine. Just like daring flapper girls of the early 20th century you can unleash your inner tomboy while still opening up your face and looking absolutely stunning. Leaving the top of your hair slightly long and perfectly curled is a glamorous take on the famous Mohawk style. We absolutely love the vibrant lilac ombre in this look. 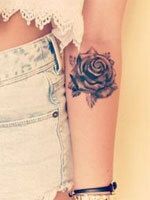 Altogether it looks softly feminine but with an edgy twist. The asymmetry in this lopsided pixie do looks completely chic and sophisticated. A cut like this is easily manageable once you get used to straightening it on a regular basis and the subtle blonde highlights really make it pop. Do you love this cut? And here are some great bob haircuts for you to choose from. Don’t be fooled into thinking that only girls with sleek, straight hair can pull off the perfect pixie cut. No matter how tight your natural curls are, you can look just as beautiful as this model with short, curly locks.